I've been waiting with high expectations for this one. 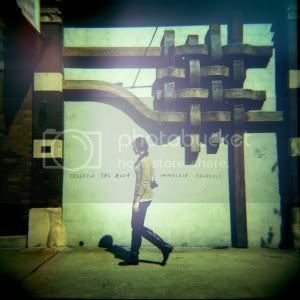 Telefon Tel Aviv are a Chicago based production duo who have recently signed to Ellen Allien's Bpitch Control Records. It was actually there that I read an insightful explanation from Joshua Eustis on their production approach to this album. I'm still trying to get my head around the entire album and I'm expecting its going to grow on me like their previous work. The first track 'The Birds' is my favourite so far. "We started making this record in early 2007, without a very specific direction. We knew that it would be created almost entirely with analog synths, and that we were ready to burn the rhodes. A disinterest in guitars followed quickly - they do not appear on the record at all, which is a strange thing for us. We slowly began the process of writing the songs, lazily, for nearly a year, while working on other music and playing some one-off shows which were mostly in support of the remix record which came out in May 07. This was the first time that we actually demoed the songs first, performed them live, etc. We concentrated first on obvious things like lyrics and melodies, thinking that we'd add the scattered electronic flourishes later. Admittedly, a creeping suspicion arose in our minds that perhaps we wouldn't go through with it again. We realize that we are strange for thinking that the most basic approach to making music is, well, strange. At the very start of 2008, we looked at what we had, and realized that it was a record, with almost all of the writing done. We began the actual production of the record in January and completed it in April - again, lazily, as we were both working on other things here and there, and dealing with life and its myriad problems (both personal and global), exacerbated by the Chicago winter. We finished nine songs, and with the help of friends, realized we needed one more to anchor it. A lyrical idea was brought to the table which spawned "Helen of Troy". We knew then, after completing this song, that we were in fact finished with our record."